A giant tortoise species thought to be extinct, is still alive, scientists believe. 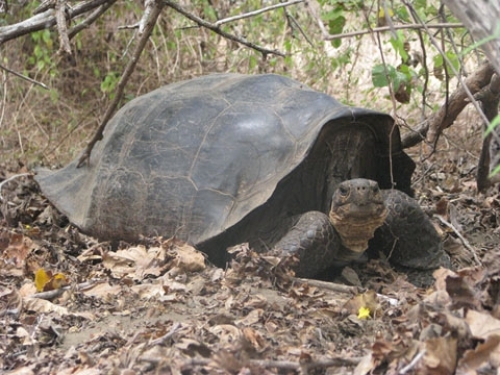 Genetic analysis suggests the Floreana tortoise (Chelonoidis elephantopus) is on Wolf Volcano on Isabela Island, the largest in the Galapagos , say the researchers led by scientists from Yale University, USA. Previously, a few hybrid tortoises were found on Wolf Volcano. Blood samples were then taken from 1669 tortoises - one out of every five - and DNA tests show 84 have a Floreana tortoise as one of their parents. Of these, 30 were under 15 years old, which suggests it is likely that the species is still alive. Dr. Linda Cayot, Science Advisor at the Galapagos Conservancy, in Washington DC, which has part-financed the work, says, "With these data in hand, the Galapagos National Park will be able to embark on a rescue mission for the Floreana Giant Tortoise species. "We are extremely grateful to all the institutions who have worked together to bring us to this exciting moment." The aptly-named Project Floreana has been recently launched at the Galapagos National Park, to help preserve and restore the island. "Returning true Floreana tortoises as part of that effort is now a dream that could come true," adds Dr. Cayot, who worked as head of herpetology at the Charles Darwin Foundation in Galapagos for more than 10 years. The pure-bred Floreana giant tortoises are believed to be on the north of the island, a few hundred kilometres from Floreana Island. Records show they were taken by whalers to during the 18th and 19th centuries and some found their way to Wolf Volcano. The Floreana was thought to have been extinct in the wild for almost 150 years. The scientist taking part in the study are led by those at Yale University's Ecology and Evolutionary Biology Department.